Since late 2009, Greece has been consistently in the news, the focus of an increasingly dire discourse on financial, but also social, crisis much bigger than what may have begun within its borders – it is the country on the brink, the country with the massive debt, the country that could bring down the euro zone, the country of pervasive graft and bloated public sector payrolls. It is the country, too, that held the wonderfully successful Olympic Games in 2004, the country that once provided affordable health care even to visitors; friends from Oregon visiting the island of Patmos were stunned to get immediate medical attention in the island clinic, antibiotics, a cast for a broken arm… It is the country where even the impoverished care about inviting friends over for satisfying meals, where filotimo (literally to honor a friend) is a near holy practice. It is the country whose inconsistencies and slower-paced ways of putting through reforms have dismayed its faster-paced northern neighbors. 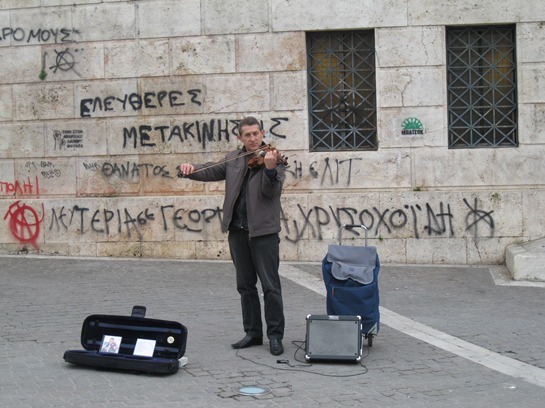 The purpose of this blog is to voice some of what has been happening in Athens from the point of view of those of us who are here, to communicate the conversations “from the streets and kitchens” as a friend put it, to talk about what is not always in the news, or what many feel is “just part of the story”. As we live this Krisi, a Greek word after all which means to view a situation critically, and in the spirit of tragedy, or tragodía, includes chorus and song.